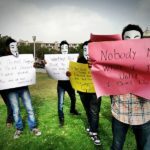 Anonymous for the past many weeks had been protesting against the attack by governments and corporations on the freedom of speech and expression guaranteed to to every Indian citizen by the Constitution of india. The protest began when the Indian ISPs began blocking file sharing sites and other websites under the order of the madras high court. 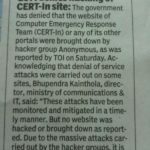 But was understood as and over done circus due to the fact that entire websites became unavailable when in reality specific URLs were to be blocked. This we see as an attack on the right to free speech. The government today censors almost all medias, the press is heavily controlled and hence is unable to speak the truth frankly without taking sides. During this time it is the Social Media that exist on the Internet that helps people share and know the truth. This is the reason why the government is desperately trying to control the internet. Once the INTERNET is censored we will loose the last and final tool we have left to exercise our freedom of speech and opinions. Saying that we have right to speak freely and not giving us a tool is a totalitarian system where a sense of false freedom is induced. Hence we Anonymous are today calling to the Indian public to stand up and start fighting. You the people are the power that should be ruling your country. And not a group of powerful and wealthy corporations and politicians. On June 9th we will be organizing massive protests in multiple locations all over the country and we are calling every one who can be there to be there. We remind the Indian public that trusting a corrupt government to solve corruption and other problems is like expecting a serial killer to catch himself. The Cities that are getting ready to take part are Bangalore Delhi Mumbai Culcutta Chennai Kochi Mumbai Hydrabad and many more. Any one who feels they need this movement needs to be in their city can start a FB page for the Occupy City movement and let us know about it. We call on the people to help spread this message and get your friends and family to join this noble cause. This is to be a 100% Non-Violent Civil rights protest. 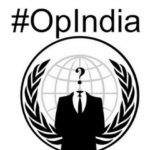 We will be updating the all the required information to http://opindia.posterous.com/anonymous-to-stage-street-protest-on-9th-june Our twitter handle @OpIndia_Back can be used to communicate with us any time. As planned the protest will take place by 3PM IST on June 9th the Saturday. Remember people of India if you do not wake up and fight, No One Else will do it for you.